Our local YMCA has been offering boot camp for adults for a while now. They installed several torture devices in the field behind the YMCA. These include giant truck tires, chin up bars and what I can only assume are trash cans designed for puking. I’ve ridden by on my bike several times but have been afraid to stop. Thomas and I were riding bikes the other day and he gave me the courage to stop by and try it out. You are now entering Boot Camp: Mommy Style. The first thing we did was chin ups. I held the chin up record at Bauer Elementary School for my entire 6th grade year. The school record, not just the record for the girls. Thomas can do one assisted chin up, which is pretty darn good. My goal is to get his upper body strength developed enough to do Trapeze School next summer. He’ll make it, one chin up at a time! If you can’t do a chin up, try just hanging from the bar. Pretend that you are on an episode of Survivor. Then we rolled tires across the field. This was way harder than it looked. We couldn’t even lift the big tire, so we rolled the small one. It is actually kind of fun. I convinced Thomas to get in the tire and I rolled him. That was super fun. We took a break and threw around the frisbee before we biked back home. It was a good morning. We laughed, we exercised and we tried something new. Nobody puked, but I’ll admit, I was a little sore. Confession: I don’t like Halloween. Let me clarify … I used to like Halloween, in two separate stages of my life. One, of course, was when I was a kid. The Jerry Seinfeld bit about Halloween pretty much sums up my experience of Halloween as a kid. Crappy costumes, the humiliation of having to wear your winter coat over said costume, balanced by the overriding joy of realizing there was a holiday with a sole purpose of getting candy. Halloween lost its luster for a bit when I was too old for trick-or-treating and too cheap to enjoy buying candy for other trick-or-treaters. And then we became parents. There is this sweet spot for Halloween when you can throw a crappy costume on your toddler, parade them around for an hour, and keep all the candy for yourself. Then one year Halloween rolls around and the kids have an opinion about what they want to wear. They have expectations about how the house should be decorated, thanks to that one over-achieving neighbor we all have. And they want to keep all the candy for themselves (except for the Baby Ruths and Tootsie Rolls, which … eww). I love Christmas and have no problem putting the extra effort into making it special, but the Halloween spirit eludes me. I dread it all and have a hard time getting into it. The one task I dread more than any other is carving the pumpkins. It’s one of those things that always sounds like a lot of fun to do with kids, until you actually start doing it. Suddenly it’s an art project gone south, with the participants messy, grumpy, and armed with sharp objects. Like previous years, I’d put off carving pumpkins until the I couldn’t hold the kids off any longer. We spread newspaper on the driveway, lugged over the pumpkins and got to work. We just got all of our supplies ready to go when a couple of the neighbor boys wandered over. Could they help scoop out the pumpkin guts? Job #1 that I can’t stand taken care of. With the guts out of the way, we moved on to design. Eli wanted a simple Minecraft design, which I obliged, while Elena was able to draw her own. 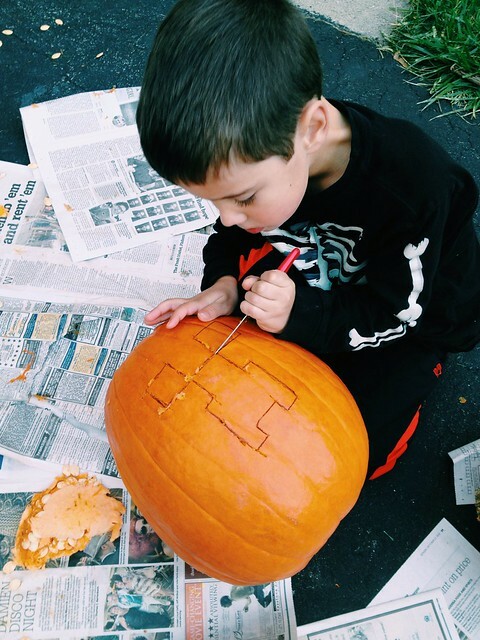 Equipped with a small, child-sized serrated knife, Eli got to work scoring the pumpkin along the lines I’d drawn. 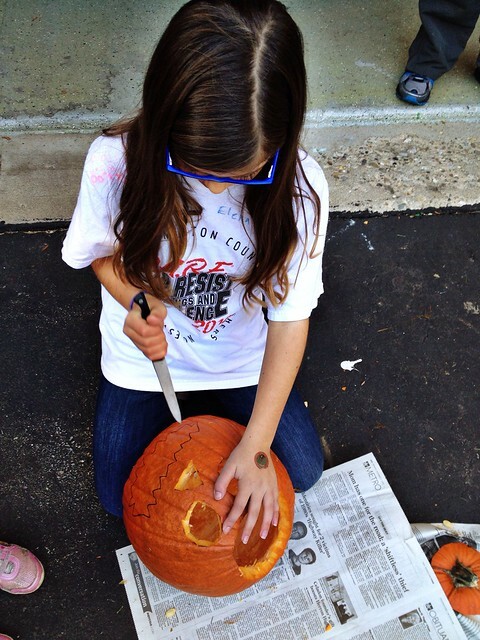 Elena, who has spent time in the kitchen this year learning some basic knife skills, carved her own. For the first time in my entire parenting career, I spent a good portion of pumpkin carving time not needed. Of course I stayed on hand to supervise, but I wasn’t the one doing all the work. Suddenly I realized how this could actually be an enjoyable activity, one in which pleasant holiday memories are made. Turns out, pumpkin carving just needed maturity, basic skills, and the ability of the parent to back off a bit to turn it into a pleasurable experience for everyone. Funny, now that I think about it, that applies to a plethora of parenting experiences! How do you feel about Halloween? In what ways do you let your kids claim some independence during this holiday? Do you let them carve their own pumpkins, trick-or-treat without you, or decide for themselves how much candy is okay to eat? Or do you feel like you have to monitor it all? We bit the bullet and got a cell phone for Elena at the end of the school year (she’s 11, by the way). It’s a touchy topic, and one that involves much debate. And like so many parenting dilemmas we face, there is no right answer, just the answer that works for your family. For all the worrying and gnashing of the teeth over kids and their dependence on tech, I have to say that knowing my kid is carrying around a phone and can be reached (or reach me) whenever needed is somewhat liberating. While some might view it as just another way we helicopter parent in today’s world, I see it as a useful tool to let go sooner for those parents who have a hard time doing so. I am more likely to say “yes” to letting her go somewhere on her own or with friends when I have the security of knowing I can reach her easily. What do you say? What age would you consider a cell phone for your kids? And does it feel like one more step towards helicopter parenting or does it make you feel more empowered to give your kids independence? Good Question: What do you do if your kids hate homework? We all have those burning parenting questions that we’d love to have our trusted group of peers weigh in on. Some of us are lucky enough to have that peer group nearby, but many of us turn to Facebook, Twitter, or even Google to ask those tough questions. I’ve always thought it would be nice for The Risky Kids to function as a community, helping those of us who consider ourselves free-range parents navigate some of the trickier parenting issues we face. In what I hope grows into a regular series, I’d like to introduce Good Question. The idea is that you guys will submit the questions that nag you. I’ll give my best answer, share any resources that might be helpful, and then encourage the rest of you to help each other out with your answers in the comments. If you have any Good Questions, please share them in the comments, on our Facebook page, or email them to Angie at theriskykids at gmail dot com. I’m looking forward to lots of Good Questions and more importantly, all of your Good Answers! Question: What do you do if your children complain about or have too much homework? A few weeks ago I came across this article by Sara Bennett, author of “The Case Against Homework .” In it, she addresses what to do if your child balks at doing homework. Depending on the age of the child, she gives different suggestions as to how to handle it both with your child and the teacher. In my family’s experience, we’ve been very lucky when it comes to the homework dilemma. For the first four years of my daughter’s schooling experience, she attended a Montessori school where homework wasn’t part of the curriculum. Even after transitioning to public school in 4th grade, we’ve been blessed with teachers who didn’t see the need to send home copious amounts of homework. Many nights she didn’t have any, and on the nights she did have homework it was easily finished in 20 minutes or less. She’s in 6th grade now, and while the amount is definitely growing, it’s still well behind the horror stories I often hear from other parents. This year my son started kindergarten. He brings home a packet at the beginning of the month with “homework” to do Monday-Thursday. It consists of short, simple tasks, like practicing letter writing or identifying numbers and colors, but the expectation is that they do the work and turn it in. For the most part he’s happy to do it, but it got me thinking – what if he hated it? Is it really a battle worth fighting, especially when he’s already in school 6 1/2 hours a day? It had never occurred to me to just not do it. (Remember when I said I was a rule-follower?) And yet, I see more value in sending them out to play or letting them veg on a couch with a good book than I do in busywork. I’m curious – do your kids have more homework than you deem necessary? How do you handle it if it’s too much or they just don’t want to do anymore? Is there a certain age where you think it shifts from not mattering to being a very important part of the educational puzzle? Confession: I hate corn mazes. Every fall I try at least one with the kids, thinking I’ll change my mind. But no. We’re terrible at them, and after 15 minutes of wandering around in crop circles we all start to panic like it’s the apocalypse and we don’t have any food. 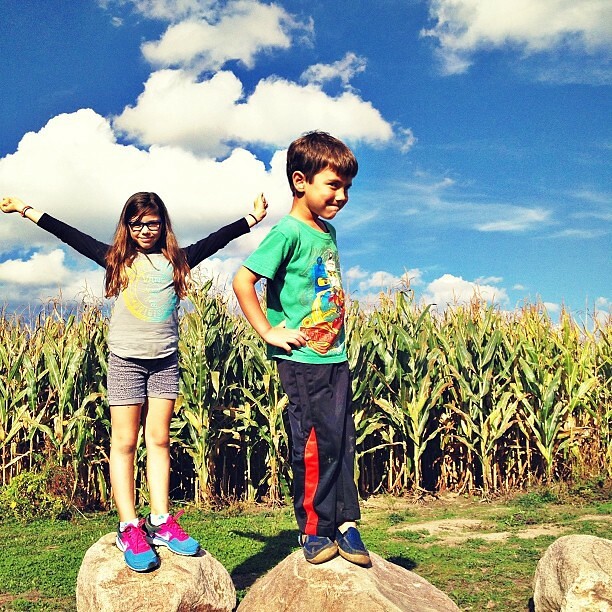 I think we’re finally all in agreement that corn mazes and this Risky Family do not mix. We’ll see you guys on the hayride. How cool is the Austin Tinkering School? It’s not every day you see photos of kids using a power saw! It’s starting to get darker earlier and earlier … no worries though! Just more opportunities to play outside after dark. The Idle Parent Manifesto: We reject health and safety guidelines. This is the eighteenth part in a series of discussions regarding The Idle Parent Manifesto, which can be found in Tom Hodgkinson’s book The Idle Parent: Why Laid-Back Parents Raise Happier and Healthier Kids. Need to get caught up? You can do so here. I admit, I don’t always make my kids wear a helmet. When Thomas got his first two wheel bike, I bought the safety kit. We suited up with a helmet, elbow pads, knee pads and wrist guards. By the time I got all that on him, frankly, he was on to the next event. I wondered why Thomas had little interest in bike riding. It was Roger who clued me in to the fact that all the safety equipment was hindering Thomas’ interest in bike riding. Bit by bit, I let it go. If we are on a greenway, I let him ride without a helmet. Around the neighborhood, I let him ride without a helmet. If we are going to be on roads with lots of cars, I make him wear it. When we mountain bike, I always make him wear a helmet. We skateboard and in-line skate. The skatepark requires a helmet and I abide by that rule. I have a healthy respect for skateboards. Those things are death wishes with wheels awesome. But for some reason, the longboard is ok without a helmet. I blame the Athleta catalogue. This is just one example of how we toe the line when it comes to health and safety guidelines in our family. The anxious parent, conditioned into living in fear by health and safety guidelines and worry-inducing media, is afraid of hammers and nails and drills and knives. Our obsession with safety removes independent judgement from the individual. It is disabling. “You can’t be too careful these days.” Yes, you can be too careful! We’ve allowed stories in the media that don’t happen that often to cloud our judgement of what is safe. I do not want to raise kids who lack independent judgement. I do not want to raise kids who go through life being too careful. What I want more than anything is for us to look at situations and think about them critically before deciding, “Safe or unsafe?” I want us to do this as parents, and I want us to do this with our kids. I want my kids to be able to think independently for themselves and to weigh risk versus benefit, instead of blindly assuming that whatever The Experts have decided is the right choice. I want them to stop and think – are these guidelines to protect me or to protect someone else from getting sued? I want them to ask themselves, “Do these rules make sense?” I want them to feel comfortable challenging us on why we do something, and I want to feel comfortable listening to them. I want to be secure enough in my authority to change my mind if they make valid points. We’d love to hear your thoughts. Are there health and safety guidelines you reject because they don’t make sense for your family? Or do you feel like that’s something none of us should mess around with? Task: Master the perfect somersault before they’re banned at your school. When was the last time you did a cartwheel or a somersault? Unless your kids are in some kind of tumbling class, chances are it’s been awhile for them … and probably years for you! Of course, somersaults are not dangerous, but like many of the things we did during recess as kids, they’re increasingly not allowed at school for fear of injury and litigous parents. We had a beautiful afternoon with nary a safety patrol in sight, so we went for the gold! Prepare. Find an area that is free of sticks and rocks. Stand with one foot slightly in front of the other. Start with the roll. Lean down, tuck your chin, and imagine curling up into a ball as you fall forward. Place your hands on the ground in front of you as you encounter the ground. Roll over. Keep leaning forward, curling up as you go, and keep your back curved as you contact the ground on the wide part of your back between your shoulder blades. If any part of your head touches the ground, you haven’t curled up enough. If the ground hits you in the back with a thump, then you probably didn’t lean down far enough. Follow through. Try to maintain your momentum and roll up onto your feet. Poor Elena … I think having directions to do something she already knows how to do made her overthink it! It also didn’t help that she’d eaten 6 slices of pizza just before we attempted our somersaults. Plain old somersaults were too easy for Eli (so he said), so he moved on to cartwheels … with debatable success (light pole 1, Eli 0). Mike had to show off, doing the combo cartwheel into a not-so-graceful somersault. I do think mine was the best, no? The best part was that we were all outside as a family, goofing off. And of course nothing draws in the neighbors like seeing you act like circus performers in the front yard! So drop what you’re doing and master the perfect somersault today! You can read about the rest of our experiences with 50 Dangerous Things. Inspired by Gever Tulley’s book 50 Dangerous Things (You Should Let Your Children Do). 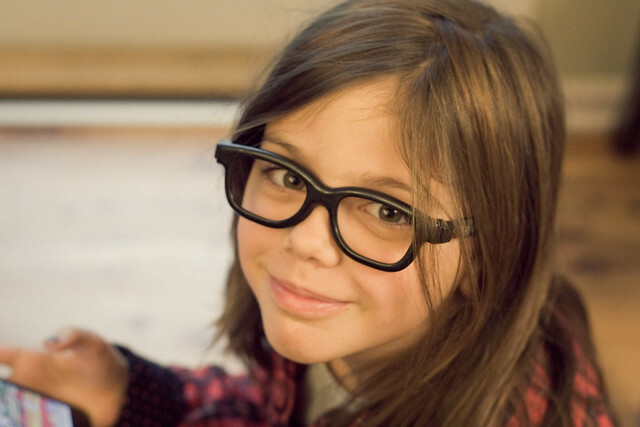 Slacker Parents: Can We Do Better? Contrary to popular belief, this is not how a slacker mom spends her days. I definitely identify with the concept of slacker parents, and find it very similar to the ideas brought up in The Idle Parent. It definitely shares similarities with free-range parenting as well. What I have a hard time identifying with is the name. Much in the way that mommy-blogging now has a negative connotation, I see being labeled a Slacker Mom as a not-so-awesome thing. I view the way I parent as hands-off, but encouraging. I don’t make choices based on what I will and won’t allow based on laziness. Instead I base them on how it will help or hinder my child from becoming a fully-functioning adult. The beauty of this method of parenting is that it eventually translates into less work for me as a parent. Call it slacker if you must, but I’ll call it responsible. And brilliant. 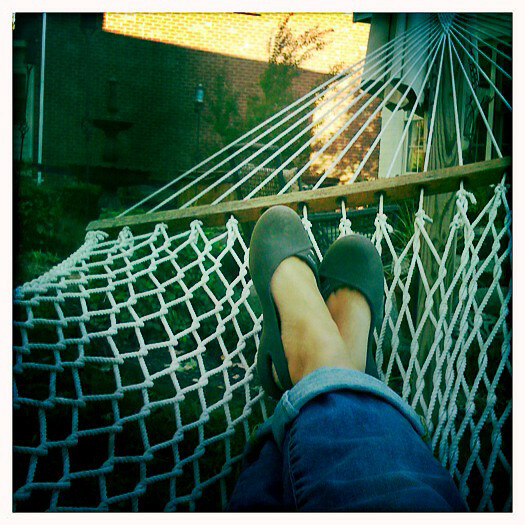 Surely those of us who parent in this manner can come up with a better term for who we are, one that doesn’t project the image that instead of parenting we are lounging in the hammock with cocktail in hand. What do you say? Do you identify with this parenting style? And if so, how do you feel about being labeled a Slacker? Now that summer is past us and the kids have settled into school, I feel like I can finally reflect on our summer. Over and over again this summer, I kept having the feeling that this summer was different. For one, it flew by. It felt like it was June and then I looked up and it was back-to-school. I also kept feeling an overwhelming sense of joy. Our family seemed happy and at peace, and most days it felt as if we were living in the moment as best we could. Now maybe every summer is like that for you, but it hasn’t been for me. Many times in the past I’ve started summer with giddiness and enthusiasm, only to feel the need to wave the white flag by the middle of July. I realize that the age of my kids definitely plays into the equation. Every summer is better than the last, as they get older and more independent. They are at a fantastic age, where they don’t need help going to the bathroom or fixing a sandwich, but yet they still enjoy being around their parents. Still, something was at work beyond the kids’ age, making this a wonderful summer. The difference, I think? Our new community. 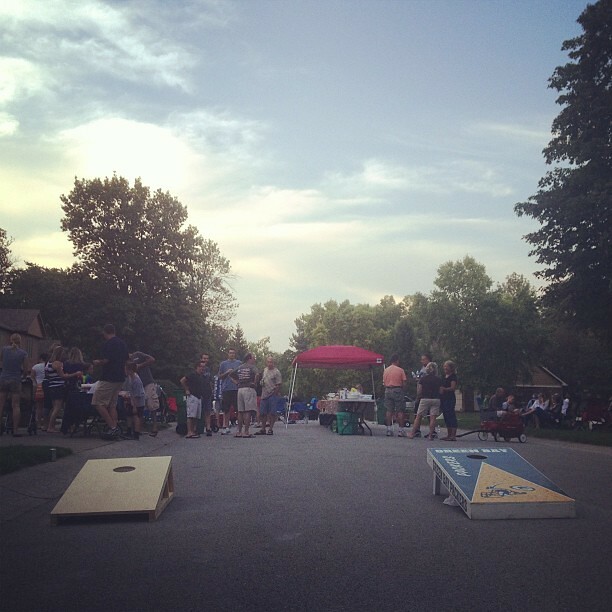 This was our first summer in this neighborhood and it had a tremendous impact on how enjoyable it was. The kids played outside every day, something I couldn’t necessarily say in our old neighborhood. They strengthened friendships, set new boundaries, and had the time and space to play away from constant adult supervision. I also played outside almost every day. I strengthened friendships as well, and reaped the rewards of not having to constantly supervise my children’s play. It was a beautiful thing, and we were all sad to see summer come to an end. Of course, not everyone can replicate our neighborhood, or move to a more playful neighborhood on a whim. But I do believe there are things everyone can do to foster community where they live, and in turn make their community a more playful one. And by doing so, we all help each other through the joys and difficulties of parenting. Here are a few steps anyone can take to build community wherever you live. Spend time in the front yard. When we first looked at this house, we marveled at the backyard and the basement. The backyard is large, wooded, and has an excellent playset. The basement is filled with toys, crafts, and a gaming system. Now that we’re here, guess where the kids spend most of their time? The front yard. I realized, as they wisely did, that the front yard is where it’s at. Modern households spend a small fortune on making the backyard a pleasant place to be. We build decks, firepits, and massive playsets. This is all well and good, and we do enjoy the backyard as a family. But when you’re sitting back there, no one can see you. And if no one can see you, countless opportunities to interact with neighbors are missed. In the past, houses were built with front porches and stoops, close to the street. In this way, you could see and be seen, and everyone knew their neighbors. Now, too often, we pull into our garages and shut the doors behind us, never to be seen again until the next time we leave. Make an effort to spend time in your front yard. If you live in an apartment, condo, or an urban area, spend time in front of your building or at the nearest park. You might be the only one out there for a while, but sometimes all a person needs is to see someone else outside to coax them outdoors as well. Now that you’re outside where everyone can see you, strike up a conversation. Kids are great icebreakers for us and give us something in common. Even if the parents aren’t out, it’s great to get to know the kids in the neighborhood. Surprise neighbors with a small treat or flowers, and leave your contact information. Consider organizing a pitch-in or an ice cream social so that everyone can meet and socialize. And if all of that is too overwhelming, just smile and wave. Just recognizing your neighbors is a step in the right direction! Invest in things kids can do in groups. I say “invest” lightly, because you don’t have to spend a lot of money to get items that will draw kids over to your home. 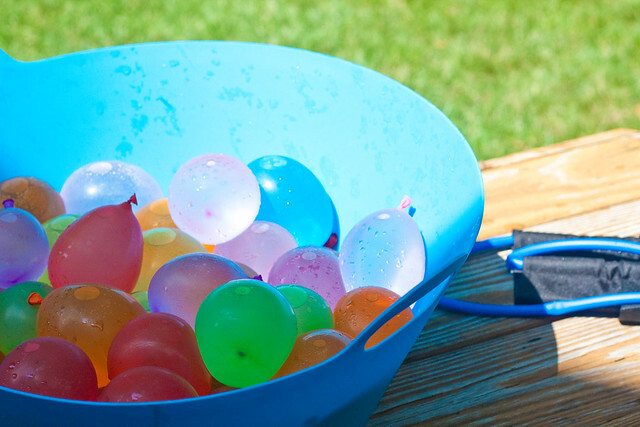 The biggest hits this summer were cheap – water balloons and chalk. The big kids loved having water balloon fights (frankly, so did the adults! ), and the younger ones could spend hours drawing with chalk. We put the slackline out front for awhile and no one could resist trying it out. Put out a tub of playground balls. Have frisbees around. Pool noodles make great “weapons” for jousting without the risk of injury. I also loved keeping a supply of cheap popsicles in our outdoor freezer (Yes, the horrible kind that are nothing but sugar and food coloring – sue me). Nothing brings kids together like sugar! It doesn’t matter what you choose, the point is to make it clear that you are a kid-friendly household and that you’re approachable. How do you encourage community where you live? Has your community been receptive to your efforts?